As Game of Thrones enters Season 6 this spring, some fans are still reeling from the absence of Jason Momoa. His presence was larger than life, but if you still haven't gotten around to watching the first season of this hit HBO show, we won't ruin it for you. 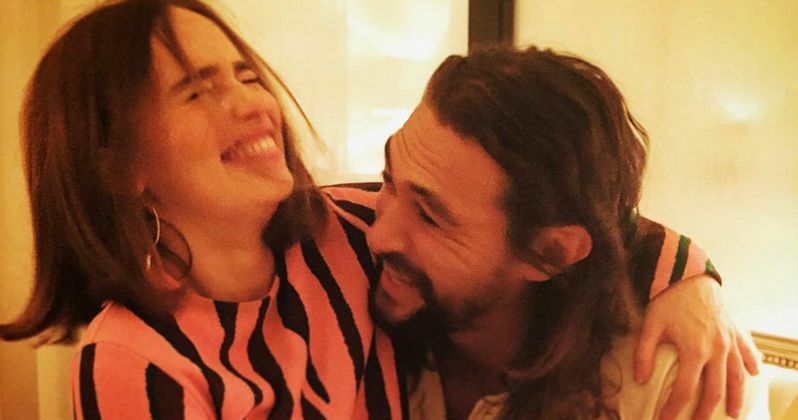 Rest assured, one person most affected by his early leave was Emilia Clarke, who dearly misses the time she got to spend with her co-worker. The two had a rousing reunion this weekend while both attended Paris fashion Week. And we have the photos that both shared on their Instagram account. Jason Momoa starred in Game of Thrones Season 1 as Drogo, the warlord husband of Emilia Clarke's Daenerys Targaryen. And as the pictures prove, love can conquer death in this fantasy landscape. About the reunion, Emilia Clarke had this to say. "Well I guess the sun rises in the west and sets in the east then huh? Paris fashion week just kicked off....!" Emilia Clarke is reciting a taunting line of dialogue from Game of Thrones Season 1 that came from the spiteful healer Mirri Maz Duur. Her full quote is: 'When the sun rises in the west and sets in the east. When the seas go dry and mountains blow in the wind like leaves. When your womb quickens again, and you bear a living child. Then he will return, and not before.' During the first season, Daenerys Targaryen is sold into marriage to the Dothraki Khal Drogo against her will. Eventually, the two fall in love. If you haven't seen the show yet, consider this a spoiler. Towards the end of Game of Thrones Season 1, Drogo bites the big piss biscuit in the sky. Though, a blood magic resurrection spell does brings him back to a state of waking death. Having lost her beloved husband, Daenerys hatches three baby dragons. She then sets out on a life of conquest. Emilia Clarke is just coming off an Emmy nomination for her role as Daenerys in Game of Thrones Season 5. She is back on set as we speak, shooting all-new episodes for Game of Thrones Season 6. She also appeared in this past summer's Terminator Genisys. While she is signed to appear in two more sequels, the movie didn't really connect with audiences. At this time, the franchise is on indefinite hold. Jason Momoa had no trouble rebounding from his Game of Thrones Season 1 death. He will next be seen as Aquaman in next May's Batman v Superman: Dawn of Justice. He will then show up in Justice League Part 1 in 2017, before getting his own solo DC Comics adventure in the summer of 2018. Take a look at these latest photos from Paris Fashion Week as Khaleesi and Khal Drogo reunite.